PayPal to Payoneer is a term that refers to a unique service offered by Payoneer Inc, arguably one of the best payment companies that facilitate online payments for merchants and freelancers on the internet. Headquartered in New York, Payoneer is a member of the leading global payment and technology company – MasterCard®. Payoneer serves customers in more than 200 countries worldwide. Payoneer’s flagship project is the US Payment Service dubbed as Paypal to Payoneer money transfer, a product that allows users to transfer money from their PayPal accounts to the Payoneer Mastercard® via a US bank account as though the users were living in the United States. Payoneer issues their account holders with a virtual US bank account where they can route money from their PayPal accounts and other select US companies. The transferred cash is then automatically loaded to the Payoneer’s debit card and can then be withdrawn from any MasterCard® Branded ATM worldwide within 12 hours! I am from Kenya and I started my online career in 2012. By then, there was no option of withdrawing money from PayPal to any local banks here in Kenya. In the same period, I heard about the Payoneer’s new US payment service that would allow me to route my PayPal funds to the Payoneer Mastercard® and later withdraw the money to a local bank ATM. It was a very good opportunity. By this time, Payoneer was charging $30 for customers who wanted to use the PayPal to Payoneer service. Today, the service is completely free for all Payoneer Users. I enjoyed the service and it was fun hearing the sound of my PayPal dollars rolling from the ATM machine. I still use the PayPal to Payoneer service which has really eased my problems of getting paid from my clients. What does it take to use the Payoneer’s US Payment Service? Using the PayPal to Payoneer service is as easy as signing up for a G-Mail or a Facebook account. First, apply for the Payoneer Mastercard® using your real names as they appear on your government issued Identity card. Then, signup for a PayPal account if you don’t have one. After your Payoneer registrations is complete, you will receive a very nice MasterCard® in your physical mail box within 21 days. Within this period , Payoneer will send you US Virtual bank account details including: bank name, routing number and account number. You will have to enter those bank details on your PayPal account in order for you to withdraw your PayPal funds directly to the Payoneer account. I have included a photo below to show you an example of a Payoneer’s US Virtual bank account details. When you receive your Payoneer debit card within 21 days and you successfully add the Virtual US bank details to your PayPal. Now, transferring money to the debit card is quite easy. First, make sure that you have at least $1 on your PayPal account. Then, find the withdrawal link on your PayPal account and choose the option of withdrawing money to a bank account. You will see the previously added Payoneer Virtual bank account on a combo box( a list of options). Just select the bank in order to withdraw the money. Then, submit the withdrawal request and you will receive a confirmation email from PayPal detailing that they are transferring money to your bank account(the Payoneer Virtual US bank account). Finally, you will receive a second email from Payoneer confirming the receipts of the funds you just withdrew from PayPal within a period of 12 hours. From there, just walk to any MasterCard branded ATM with your Payoneer debit card and withdraw the money. 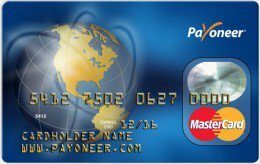 Who can use the Payoneer’s US Payment Service? If you are a merchant or a freelancer who wants to receive payments from customers via the internet, Payoneer is a better option for you. With the account merged with PayPal, you will get all the benefits of being paid without problems and getting your payments on time. This will allow you to concentrate on things that matter such as marketing your business. The PayPal to Payoneer Service is also suitable for freelancers who come from countries where PayPal to local bank withdrawals are not supported. Since most clients like paying via PayPal, freelancers can still access their funds on the go using Payoneer and become more productive. So, in a nutshell, Payoneer to PayPal service can ease the way business is done on the internet. Payoneer has been operating for more than 11 years and is continuously enhancing its product’s portfolio. So, if you want to take advantage of their flagship product that allows you to withdraw your Paypal funds to a local bank ATM, Signup for Payoneer Mastercard and get $25 free, grap the US bank account details and simply walk to any ATM to get your money whenever you receive a payment from your clients. Contact Paypal and they will do an adjustment so that you can add the account.